Whether the kids are having a sleepover, you’re planning a birthday celebration, or you just don’t feel like cooking dinner, pizza is always an excellent option. In Indiana, you’ll find a variety of restaurants serving up authentic, old-world style pies and contemporary takes on the staple that you’ll only find within the state. 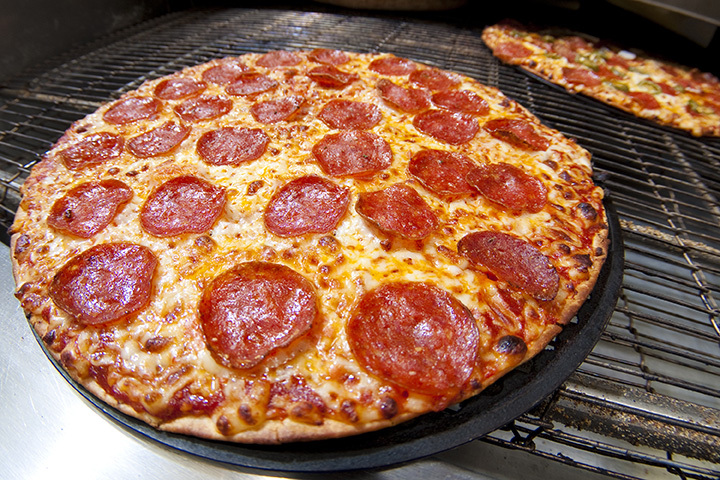 For all the best toppings and more, check out these 10 best pizza restaurants in Indiana. Family owned and operated since 1962, Martino’s Italian Villa has been a family favorite among the residents of Kokomo for the last 55 years. Serving up some of the best pizza in Kokomo, this beautiful Italian restaurant was inducted into the Pizza Hall of Fame earlier this year. It’s the family friendly, old world atmosphere that makes Martino’s a favorite. Six days a week you can still find co-founder Angela Martino working in the kitchen, serving up delicious, home cooked Italian food with the rest of her staff. Try the home made Italian stromboli or the Italian meatball! Another place to find excellent pizza in the city of Kokomo is Ned’s Corner Pub on the corner of Markland and Main Street. In business for over 30 years, Ned’s Corner Pub is the place to be. For the veggie lovers, try their all veggie pizza and for the meat lovers, the all meat pizza is delicious! For something a bit more unique, try the pizza sandwich supreme. There is a family section separate from the bar area, as well as smoking and non-smoking sections. The Corner Pub also offers live entertainment, as well as themed events around the holidays. Family owned and operated, Arni’s has been serving up some of the best pizza in the Lafayette, Indiana area since 1965. From offering pizzas with gluten free crust to the Killer Cajun and the Maui Zowie, Arni’s has a variety of pizzas to choose from. Try the original barbecue, an Arni’s classic. Another great thing about Arni’s are their “Cause Nights” in which they provide local organizations the opportunity to raise money for their organization or their cause on designated days. Meet you at Arni’s! Located in the “Crossroads of America” town of Seymour, Mike’s Pizza is the place to find some of the best pizza in Indiana. The people are friendly and the pizza is outstanding. Not to mention the prices! And they don’t hesitate on the toppings, another plus. What more could you ask for? Not sure what to try? If you’re feeling a bit risqué, try the chicken bacon ranch pizza or the Artesian Italian! With three locations throughout the Indianapolis area (Broadripple, Carmel, and Indianapolis), there are plenty of delicious and delectable pizzas to go around. Serving up some of Indy’s best pizza since 1986, Bazbeaux’s is a favorite among the locals. From the Pizza Alla Quattro Formaggio, Colossus, Mediterranean (a personal favorite along with the Bazbeaux special), there are dozens of options to choose from! You can also choose from a variety of exotic toppings for your pizza as well, such as fontina, black bean dip, salsa, capers, and eggplant. Don’t forget your dessert! The orange sorbet is to die for! If you ever happen to find yourself on East Market Street in Logansport, Indiana, and craving pizza, be sure to stop by Bruno’s Carry-Out Pizza. Family owned and operated, Bruno’s has been serving up tasty and delicious, mouthwatering pizzas since the 1960s, carry out style. That’s right. These delicious pizzas are only available to go, and you can order them half-baked to store in the freezer for another time! Make a trip down to Main Street in Lafayette, Indiana, and visit Professor Joe’s Sports Pub & Pizzeria. Enjoy a “pint and a pie” with a friend in this upscale joint, whether it be the one of the house specialty pizzas, such as the Cornhusker Pizza, the Boilermaker, the Tailgater, or the Hoosier Pizza. Don’t forget to ask about their featured pizza of the week as well! If you aren’t feeling very adventurous, you can always order the standard build your own pizza. If you want a little personality with your pizza, check out Puccini’s in Fishers, Indiana. In business for over 25 years, Puccini’s is unique compared to other pizza joints around Indiana in terms of their menu selection. Whether you have dietary restrictions, a need for gluten-free items, or want a low-carb alternative with vegetarian options, Puccini’s has it all! The ingredients are fresh, and each item on the menu is prepared fresh every day. Head on down to New Albany, Indiana, and make a pit stop at Tony Impellizzeri’s Italian Restaurant for some of the best pizza southern Indiana has to offer! Everything is homemade, including the pizza sauce and crust! Choose the Sicilian deep dish to specialty pizzas such as the bacon cheeseburger pizza, tomato and garlic pizza, or the four cheese pizza. Not sure what to get? Try the Sampler, which has a mix of Italian sausage, onions, green peppers, mushrooms and more! It’s scrumptious!